The Bow is the most recognizable building in the Calgary skyline. It is at least for now, the tallest building outside of Toronto – not just western Canada. You can see it from almost anywhere in Calgary, and it is an impressive skyscraper. Even the Calgary Tower can’t compete with the Bow when it comes to things that are synonymous with Calgary. All pictures and postcards of the Calgary skyline had to be updated once the Bow was completed in 2012. It is that impressive. This project was proposed in 2006 by Encana, a leading oil and gas producer in Calgary. At first there was talk that they would build two or three buildings and then some speculated that they would build the tallest building in Canada. However by October of 2006 they had secured the services of the world renowned architect Norman Foster of the UK and he unveiled his plans for the site. The Bow was unveiled as a 58 story 247 meter crescent shaped skyscraper. There was also a second building anounced that would incorporate the old York hotel on the south side of the site. Shortly thereafter, the tower was shortened to 236 meters because of concerns that the building would cast too much of a shadow on the walking and cycle paths beside the Bow river. Construction started in the summer of 2007 and caused a great deal of traffic congestion because the city allowed the development company Mathews Southwest, to close down 6th Avenue to allow the parking garage to be built under the street. Also in 2007, Encana sold the project to H & R REIT and signed a 25 year lease to occupy the entire building when it was complete. Construction of the Bow was stopped for a short amount of time when the global financial crisis hit in 2008, because they didn’t have all the neccessary financing in place. However, the additional $400 million was quickly secured and construction continued. The building was constructed with a steel frame, so three very large cranes were used to lift the extremely heavy beams into place. In total the building used 48000 tonnes of steel. 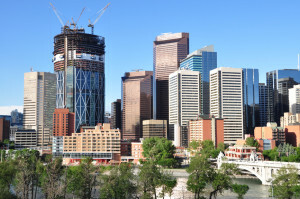 In July of 2010 the Bow reached the 715 foot mark which now made it taller than the city’s previous tallest building, the Suncor Energy Centre, right accross the street. Then a couple of months later, it reached it’s ultimate height of 775 feet. The Bow was completed in 2012 and cost over 1 billion dollars to build. The building had it’s official grand opening with fireworks, speeches, and tours in June of 2013, well after much of the staff had already moved in. A giant head sculpture by the renowned artist Plensa was also unveiled and it added to the draw of the building as a tourist attraction. Now anyone that is wandering around downtown checking out the sights has to walk over to the Bow to marvel at it’s sheer size and beauty. The Downtown Calgary office market continues to defy logic with several new buildings recently completed and many more planned and under construction. Eighth Avenue place was recently completed with the second shorter tower finishing work a few months ago. The next high profile building will be the Brookfield project that is under construction at the old Calgary Herald site right behind The Bay. This building will take the crown of tallest building in Calgary from The Bow when it is complete in 2017. Next, there is the City Centre project that is rapidly rising near Eau Claire and should be ready for occupancy by the summer of 2015. Probably the most interesting and attractive new building will be Telus Sky, which has yet to start construction but will be composed of office space and residential rental units. The architect for this building is the world renowned Bjarke Ingels. This beautiful building will begin construction this summer and will be located very close to the Bow, and many say the two will compliment each other with Telus Sky being almost as tall as the Bow, but with a thinner and twisting shape. Even some of the older buildings are renovating to try and compete with all the new buildings. They really don’t want their tenants moving to one of the new buildings so they need to do something to retain them. Downtown is still the place to be for most large to midsize companies despite the fact that Imperial oil and the Canadian Pacific Railroad have both made the decision to move their operations to Quarry Park and Odgen respectively. Leasing activity is still strong and Carmen Paradis of Remax real estate central expects that to continue for quite some time. Alberta’s economy in general is doing great and even Edmonton is getting some new projects with the most notable being the new arena that recently broke ground. The city of Edmonton is also starting work on a new 27 story building and there are rumours that Stantec will build a new tower soon. Robert Eskiw of Remax real estate north says it is an exciting time and there may be more projects that are tied to the new arena. Alberta continues to attract people from other provinces and other countries and this is not expected to slow down any time soon. According to the Calgary Herald, Calgary now has a population of almost 1.2 million and added over 30 thousand people last year alone. We are expected to lead the country in economic output for the next few years and job creation is still very good, so many people are choosing to move here and start a new life. Calgary and Edmonton are both very attractive for corporations to do business, so we could see more companies relocate to take advantage of the favorable tax rates and a young highly educated workforce. For corporations, it is very important for their employees to have a good work – life balance and Calgary makes that very easy. For a large city, it still has somewhat of a small town feel to it and many people find that very important. There are tons of things to do in and around Calgary with your spare time. Being only an hour away from the Rocky mountains opens up a whole world of recreational activities such as hiking, canoeing, kayaking, biking, skiing, and sightseeing. There are also two large urban parks within the city limits with Fish Creek Park crossing the southern part of the city, and Nose Hill Park being in the middle of the northwest part of town. Every community has access to recreation centres and there are numerous walking and biking paths that cover he entire city. Most companies also offer their employees opportunities to bond away from the office in the form of corporate team building. One of the easiest teambuilding activities to organize is a hiking trip which shouldn’t be too strenuous because everyone on your team will have different fitness levels. Another great idea is to take cooking classes where you get to learn how to make something delicious and sit down together and dine on your creation when you are done.